HomeNo-buy Christmas rule #2: Invite friends over to make something beautiful. My bedroom closet is overflowing with art and craft supplies just waiting for a project. A no-buy Christmas sounds like just the project. 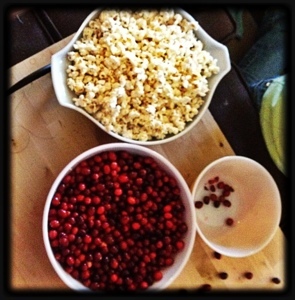 To kick off the decorating, I let the kids invite their friends over to string cranberries (Thanksgiving leftovers) and popcorn (a staple snack around here) for our tree. 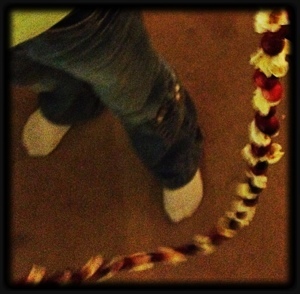 The more kids, the longer the strands! I turned Pandora to the Bing Crosby holiday station and set the kids loose on giant bowls of popcorn and berries while I hung the lights on the tree. 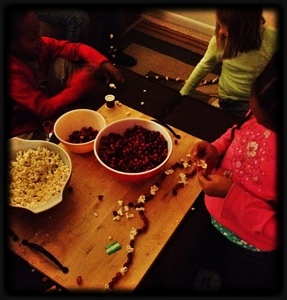 I’m pretty sure the kids ate more popcorn and cranberries than they strung. 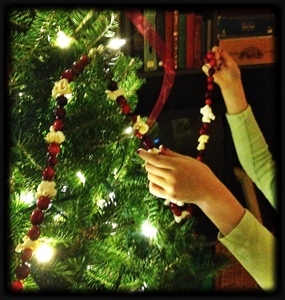 After three hours and a giant mess of popcorn crumbs and squashed cranberries, our tree is now adorned not only in pretty red and white strands, but also in memories of a cold afternoon spent with friends. ← No-buy Christmas rule #1: Break the no-buy rule and buy a tree.